This program provides leadership for soil management and environmental programs that support agricultural production and environmental quality in Iowa. Extension and research programs provide information and support to extension personnel and agriculture professionals in the area of soil management and the environment by conducting field research and demonstrations, participating in field day and training workshops statewide, developing best management practices, and producing educational materials, extension bulletins and refereed journal articles. Our research focuses on addressing environmental issues as related to soil/water management and conservation practices. 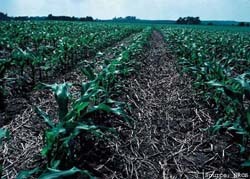 The program conducts applied research and demonstration projects investigating and studying soil management and conservation practices impacts on: water quality, soil quality, nutrient management, and carbon sequestration as related to long and short-term nitrogen, tillage, and cropping systems effects. Iowa State University Agronomy Extension, Ames, Iowa. All rights reserved.